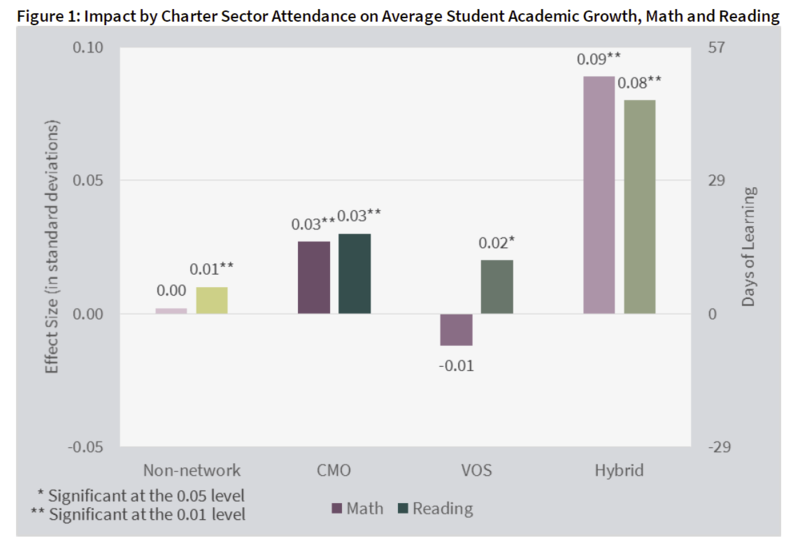 Washington, DC –What charter school management structure produces the highest student academic growth? A new 111-page report of a four-year study by Stanford University’s Center for Research on Education Outcomes (CREDO) addresses this question and cites a “Hybrid” structure as demonstrating the best results. The collaboration of Charter Day School, Inc. and its four charter schools with The Roger Bacon Academy, Inc. epitomizes the Hybrid structure (CDS/RBA). 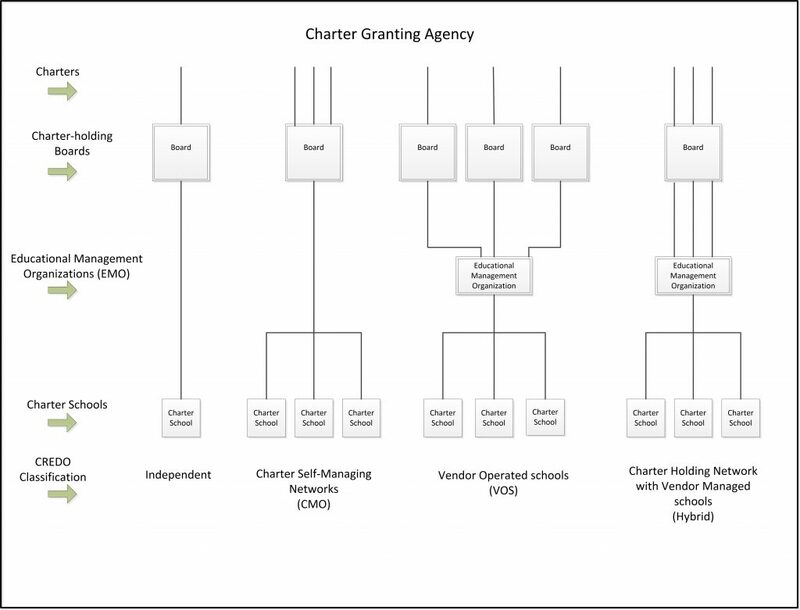 charter-holding networks with vendor managed schools (Hybrid). The comprehensive study compares the students in each structure with the students in their neighboring traditional public schools (TPS) and examines their academic growth from the first year to the fourth year of the study – from the 2011-12 year to the 2014-15 year. Hybrid structures, as graphed in Fig. 1 in the CREDO report, show dramatically higher student academic growth in both math and reading than any of the other structures when compared to the TPS. Based on the same 180-day school year for each group, the gain for Hybrid students “is equivalent to 51 days of additional class time” in math and “the equivalent of approximately 46 days of additional learning” in reading compared to their matched peers in the surrounding traditional public schools, TPS. This extra learning equates to approximately 24% more learning in a year, on average, for the Hybrid student. Hybrid schools also had the highest percentage of students in poverty and the highest percentage of Black and Hispanic students among all management structures. Figs. 14 and 15 from the CREDO report compare the academic growth rates of students in the different network structures by subject. 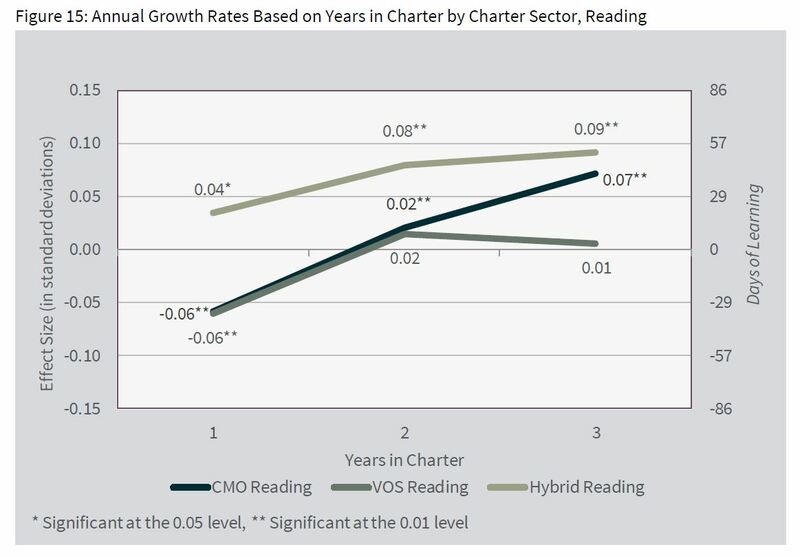 Both reading and math experienced the fastest student academic growth with the Hybrid structure as is used by CDS/RBA. For policy makers, there are several important lessons to be learned from this new study. First, there is the clear lesson that encouraging Hybrid structures to expand holds the best promise for scaling up the academic growth of students. Second, virtually all of the Hybrid networks had non-profit charter holders with for-profit management companies as does the CDS/RBA network. This should not be a surprise when considering that many modern marvels such as the iPhone and Google are the result of the free market with its profit incentive at work. 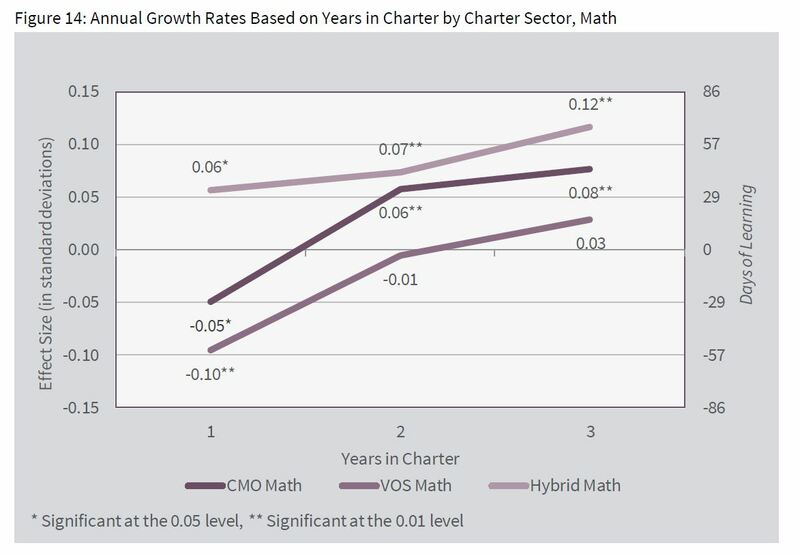 Third, since tuition-free charters operate on much less taxpayer funding than traditional public schools, Hybrid charter networks represent the most efficient use of taxpayer money.